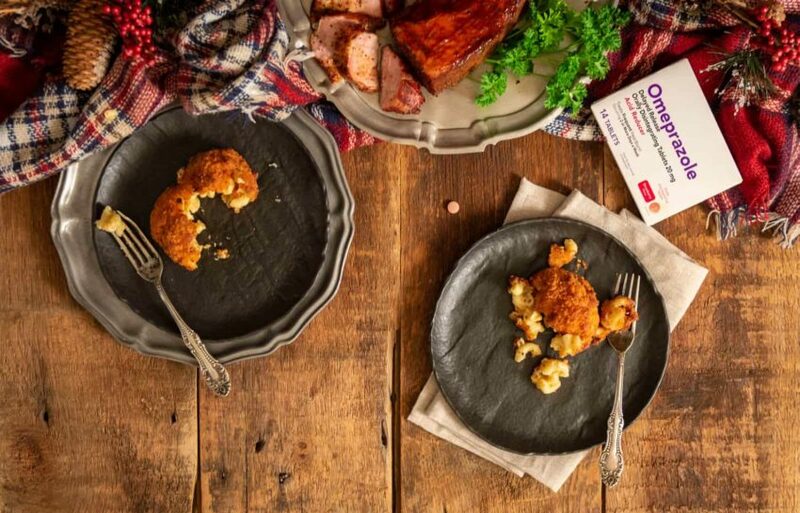 Deep Fried Macaroni and Cheese Balls are the new must-have recipe at your dinner table. Fun, light, and filled with a customizable family favorite! OK, admit it. We are all guilty of a bit of overindulgence for the holidays. And why not? It’s sweater weather and we can hit the gym hard in January. But while the calendar is flipping through the feast-laden holidays, I will be the first to admit that I am going back for a slice of pie or saving room for just one more bite every single time. I try to play it cool, putting just a bit of each of my favorite things on the plate, knowing I lack the necessary willpower to turn down a second trip to see what else I must try. Thinking that I am saving myself by just one or two bites here and there. But, eventually, I have to surrender to defeat knowing that that last bite was the oh-so-worth-it-creamy-delicious-buttery-one that sent it over the top. Overindulging again. Yep, I’ll be at the gym every day in January and it will be worth it. I mean, deep fried mac and cheese balls alone make it worth it. Besides the common acid and fatty choices that can cause heartburn to flare up, overindulging can also trigger common symptoms. Luckily, for frequent heartburn sufferers, Omeprazole’s new easy-to-take orally disintegrating tablet is perfect for helping dissolve heartburn for those who suffer 2 or more times a week. You don’t even need a glass of water with the MELTechTM strawberry flavored tablet. You can take one for up to 24 hours of relief, perfect for managing the pre-game snack, dinner, and a sampling of the dessert table! 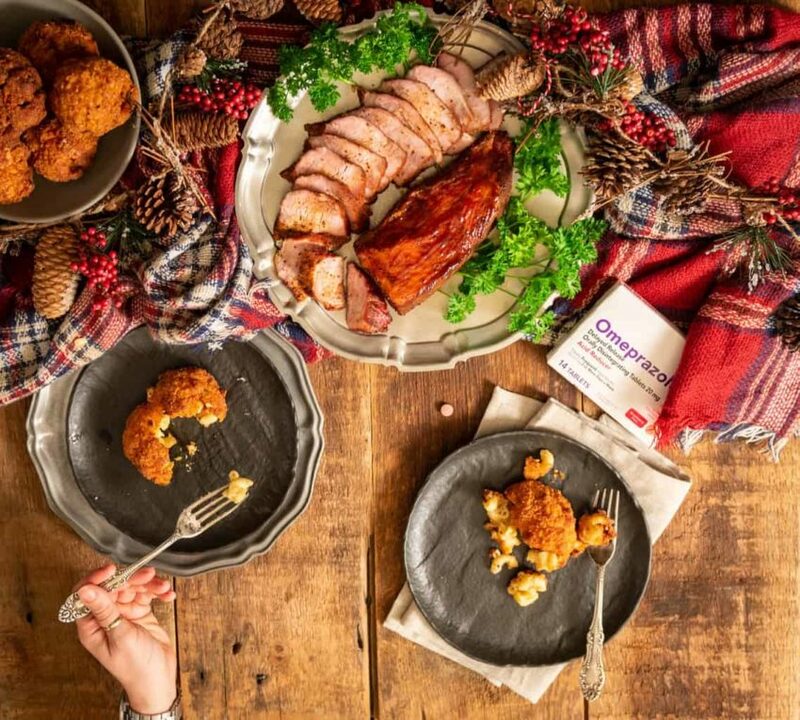 Grab a package of Omeprazole ODT before hitting the road for the holidays and get to sharing in the traditions, and one more bite, and less heartburn suffering. (Use this store locator to find it in your area). This year, I am mixing up my holiday menu and adding in some fun twists to the options. 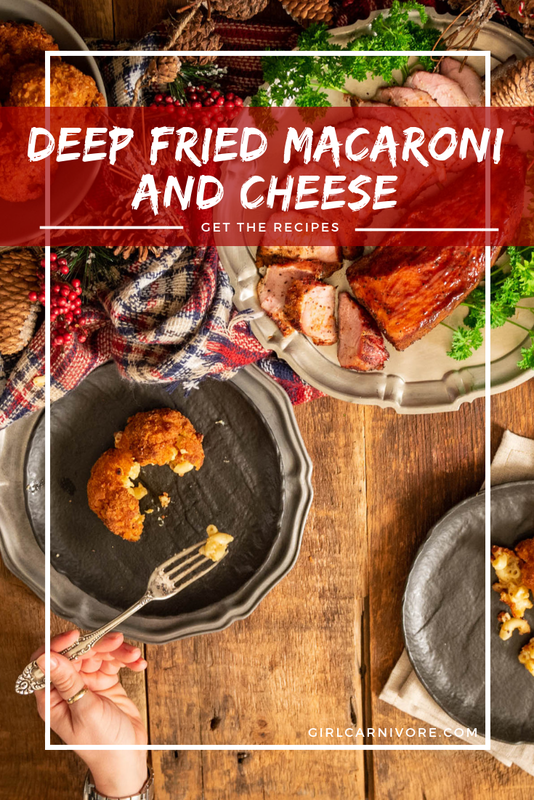 Deep fried macaroni and cheese recipes have been on my radar for some time, and it seems like the perfect meal to test them out on. No spooning piles of creamy mac and cheese onto the plate. Let everyone grab a ball and pop through the crust to find that melted cheesy pasta on their own! What’s on your Thanksgiving menu? 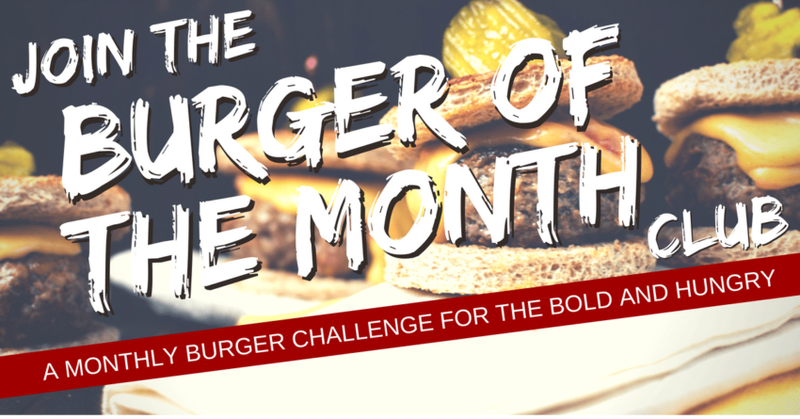 Are you prepped and ready for just one more bite? Want some Macaroni and Cheese Inspiration? 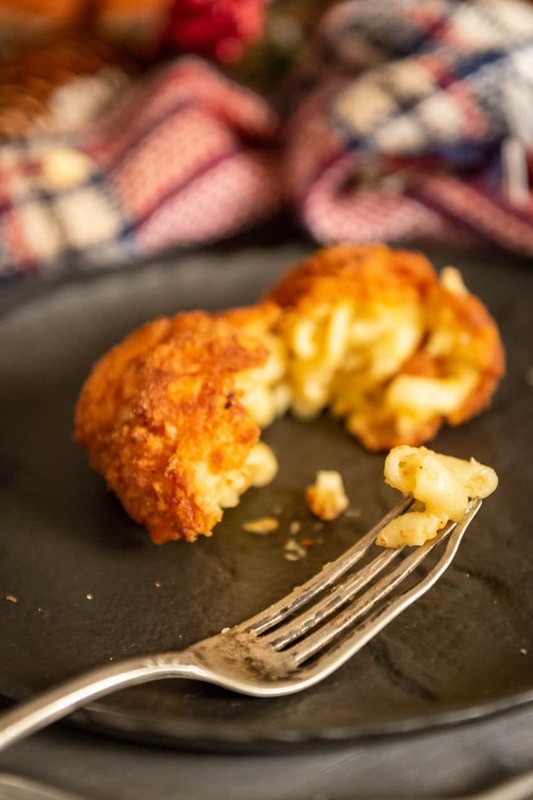 If you’ve tried my Deep Fried Macaroni and Cheese Balls recipe, or any other recipe on GirlCarnivore.com please don’t forget to rate the recipe and let me know where you found it in the comments below. I get inspired by your feedback and comments! 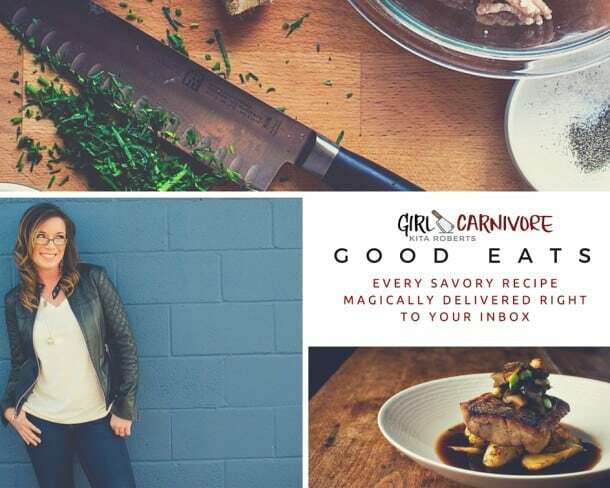 You can also FOLLOW ME on Instagram @girlcarnivore as well as on Twitter and Facebook. 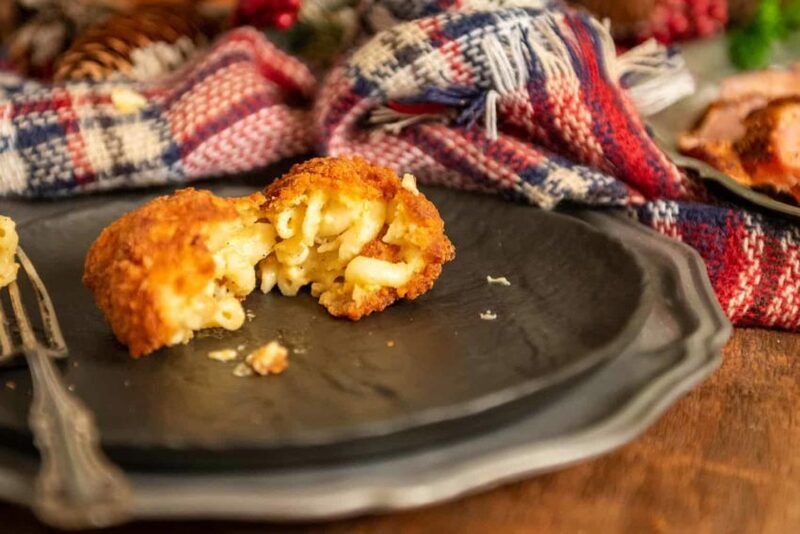 Fried Mac and Cheese Balls are the new must have recipe at your dinner table. Fun, light, and filled with a customizable family favorite! In a large bowl, mix the crumbled bacon into the macaroni and cheese. Cover and chill for 6 hours in the refrigerator. Set up your rolling station by arranging the eggs in a large bowl next to a bowl with the breadcrumbs. Remove from fridge and with your hands or a large cookie scoop, form the mac and cheese into tight balls. You will have between 12 and 16 balls depending on how big you make them. Working one at a time, dip each ball into the eggs, turning to coat evenly. Drain any excess. Transfer to the breadcrumbs and roll the mac and cheese ball in the bread crumbs, coating evenly. Place the breadcrumb coated mac and cheese ball onto a baking sheet. Arrange the baking sheet in the freezer to allow the balls to freeze in a single layer. After freezing for at least 4 hours, you can store the balls in an airtight container in the freezer until ready to fry. When ready to fry, fill a large heavy-bottomed pot with oil, leaving 2 inches from the surface of the oil to the top of the pot for safety. Heat the oil over medium-low heat until hot enough to fry. Preheat the oven to the warm setting, or 180 degrees. With a long-handled slotted spoon, dip a macaroni and cheese ball in. Fry, rolling as needed, until golden brown all over. Carefully remove the macaroni and cheese ball from the oil with a slotted spoon and set on a rack over a baking sheet to drain. Keep warm in the preheated oven. Repeat the steps, adding no more than 3 balls at a time, to keep the oil temp even, until all of the macaroni and cheese balls are fried. Allow to the last ball to cool at least 3 minutes before serving. Sprinkle the deep fried macaroni and cheese with salt and serve hot. That is awesome using bacon with macaroni. I am going to try this recipe on the weekend for my family. These look incredible. I have made Arincini before and my family loved them so I am sure they would love these fried mac and cheese balls. I think these will be on this weeks menu. This recipe is proof that absolutely everything is better when you fry it. I must have this in my life! Hands up I love Mac n Cheese, however I have never thought about having it deep friend, I bet it makes for an interesting side dish and something I would really love to try myself. I remember when this trend started a few years back and I still haven’t tasted deep-fried mac and cheese. I need to try your recipe ASAP. Looks so delicious. 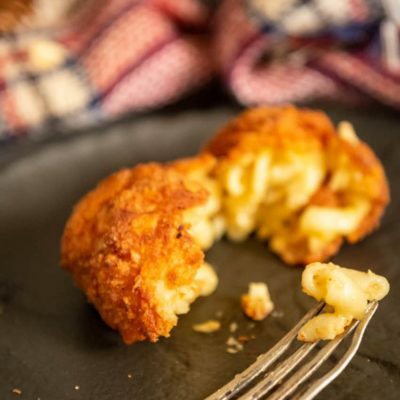 These mac and cheese balls look so yummy and decadent. I am a huge fan of mac and cheese and would love these. My kids love mac-n-cheese! I think this would be a great hit with them. It looks so delicious! This sounds like pure heaven! I am drooling over here. I can NOT wait to make this. I have never tried a deep fried mac and cheese dish. I wonder, is it dry at all because I love a really cheesy gooey mac and cheese. I have GERD and take a higher dose Omeprazole that is avaialbe OTC. Oh yum, I need to try this for sure. I love regular mac and cheese, so I’m sure I’d be a fan of a deep fried version. I love that there is bacon! Oh, My! This looks and sounds amazing! Looking forward to giving this recipe a try, and also checking out the product you’ve mentioned. Oh wow. These sound so good 😉 Yum! I love macaroni and cheese – I can only imagine that frying them would take it to the next level! I recently had some of the best mac and cheese and it was made with gouda cheese. The sound of deep fried mac and cheese sounds decadent. Sounds like something to add to to the Christmas holiday season. I think you can deep fry just about anything and it would be delicious. I bet my 9 year old would love this! Oh wow, this looks delicious! I want to make these so much, they would be great appetizers to take for a party. I know they would be a big hit! it looks like you are all geared up for holiday, babe! These look like an excellent appetizer to bring to my family’s Christmas. Awesome, thanks! Look like an interesting appetizer or side dish, probably making this for my Xmas party dinner. Lets see if I succeed the experiment on this weekends. Oh gosh, I think fried mac and cheese sounds amazing!! I need to make these ASAP!! 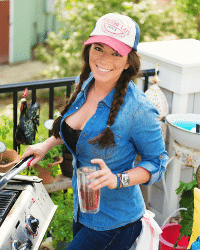 Santa is bringing an air fryer to our house and I would love to give these a try! They look so good! Id love to try this with an air fryer! Love your recipe! Can’t wait to make it for our Holiday Open House! They look soooo good! I’ve always been a fan of mac and cheese, but this is definitely something I’d like to try sometime with the kids. I would love to try this variation of a baked mac and cheese. the pictures look tempting! Omg can we say yum?!?! I love deep fried Mac & cheese!!! So giving this a try! I’m salivating after reading this! I love macaroni and cheese, and to have it like this puts a great new spin on it! Delicious.